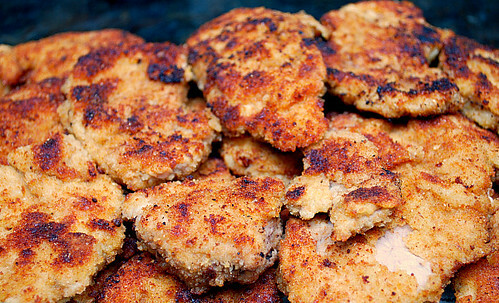 To Make the Schnitzel: Tenderize the chops or sirloins with a meat mallet. Set out three shallow bowls. In the first, put the flour, which you’ll use to dredge the pork. Next is the eggs and milk, beaten together. Dip the floured pork into this mixture. Put the bread crumbs into the third bowl, and use it to coat the floured and battered pork. Let the pork sit about 15 minutes before frying. Heat the oil in a skillet, and brown the chops on both sides. Serve with the sauce (recipe follows below). To Make the Sauce: Heat oil in saucepan; sauté mushrooms, onion, and bell pepper until tender. Sprinkle with the flour and stir to blend. Cook, stirring, another minute or so. Add beef broth, and continue to cook, stirring occasionally, until thickened. Add Kitchen Bouquet (it adds good color and a bit more flavor to the sauce) and pickle-salad mix. Taste and add salt, if necessary. Serve over schnitzel. Your food end presentation is very delicious! 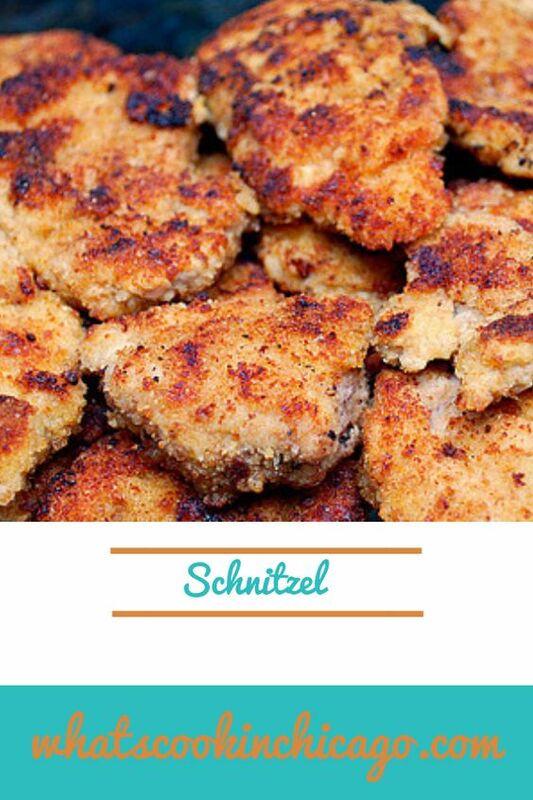 Schnitzel was always a standby favourite in our house - it falls into that "memories of home" category. Yours looks spot on and delicious not to mention perfect for this time of year. Hi Joelen. I came across this blog entry....well, I'm not exactly sure how I got here! Pinterest I think led me here....but anyway this is an older posting, but I am very interested in the person "Maria" who is mentioned as having found this recipe for her Dad who was stationed in Germany and loved the Zigeuner Schnitzel from a restaurant near where he was stationed in Germany. My husband and I were also in Germany in the military I and have looked high and low for a recipe for a Zigeuner Schnitzel. No German restaurants have even heard of it here. Wouldn't it just be amazing if it was the same little restaurant in Neiderweiler, Germany from all those years ago....like 30!? It was called "Mom's" and the American GI's loved to eat there because the food was phenomenal. Anyway, long explanation, but just a fun coincidence in our great big world....if it is the same place that is! Maybe you could ask her if her Dad remembers the name of the restaurant and if it was in Neiderweiler, Germany? Palacemanager, I'll definitely ask Maria and will update here if it is in fact the same restaurant you recall! What a cool coincidence if it is!